Spencer Group were approached by the Nobel Exhibition Trust to construct the first retractable bridge which was the longest of its kind at the time of commission. This project is recognised as “The Scottish Bridge of Invention” and is acknowledged as a highly innovative piece of engineering. 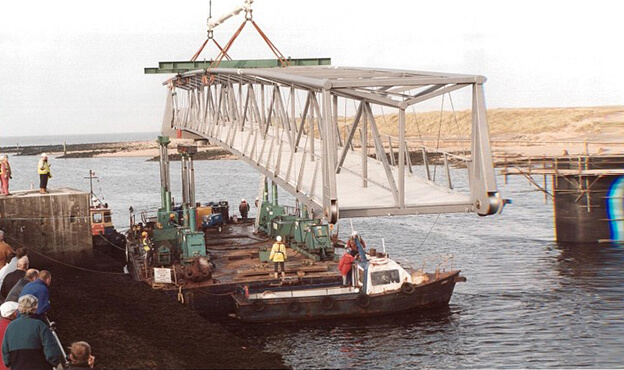 The 60m span ‘retracting’ bridge structure provided an essential opening for the navigation of 18m wide ships. At the time of construction, it was the longest of its kind in the world. Spencer Group delivered a range of benefits for our client through providing innovative and alternative design solutions. For example, we proposed designs requiring a reduced level of marine piling and embankment works, together with reduced wind loading when in the open position: a major factor on the exposed marine estuary. The project involved Spencer driving large tubular steel piles, 2000mm in diameter, through utilising the company’s own piling operatives and our self-propelled piling barge the ‘Meeuw’. 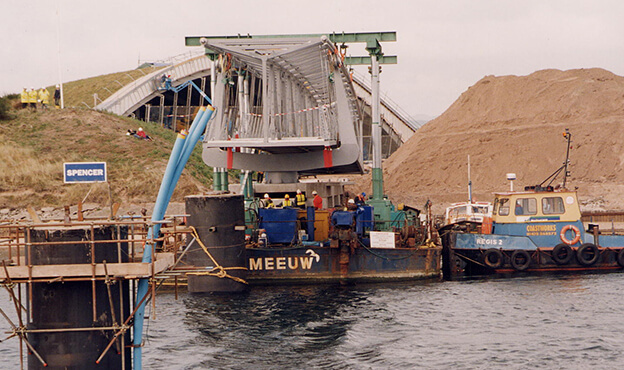 The barge was also used to transport and install large prefabricated sections of the bridge to the north bank of the estuary where there was no access for heavy lift. On this project, Spencer Group provided an innovative alternative design to the client’s original solution for an opening bascule bridge. 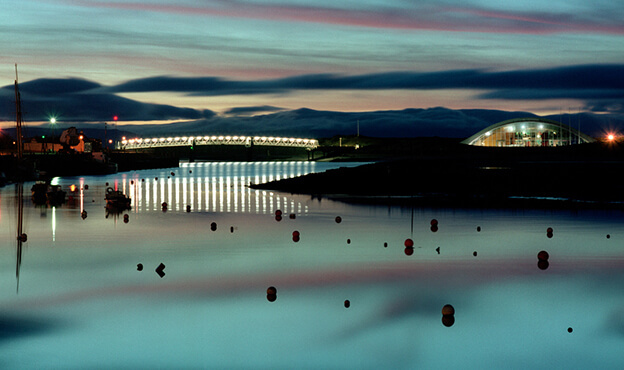 The bridge is acknowledged as the “Scottish Bridge of Invention”, acting as an iconic structure and providing a key pedestrian access route across the harbour.